The epiphany for the last 24 hours: wow, that was a great workout. I worked, I sweated tons, then I was done, and now I’m a little sore in the hips. It can be just that. Most of the time, it’s that. Which is mainly great because it was an hour that wasn’t spent fretting or checking things off lists or running to and fro, trying to tie off the rest of life’s daily, weekly, monthly strings. Last night was the final lecture of my Power/Vinyasa yoga teacher training course. The founder of the corporation via which I’m taking the course gave us 2.5 hours’ worth of information on the business of yoga. The fact that there’s an oxymoron or two in there there (yoga and business?) was not lost on him, but his model appears to be working, so I was there to absorb what he could share. So, an open invitation to think big, and think crazy. Which is exactly what my decision to become a yoga teacher was, for me. It’s been an interesting 8 weeks. The photo above, how to tie it in? It’s just a pretty logo that I saw in my neighborhood, during a recent walk. It reminded me of a trip to Cape Girardeau, Missouri, a couple years back. 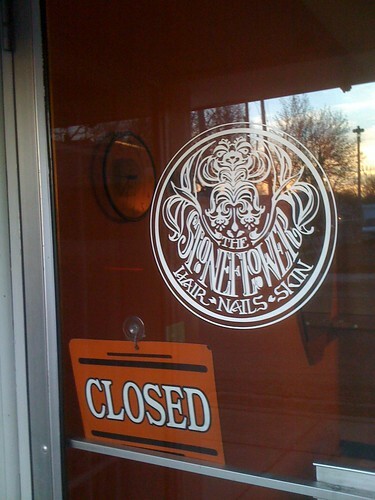 The salon is across the street from a storefront that housed a yoga studio, a few years back. It closed, and from what Mr. Tice told us, that’s often the fate of yoga studios. I think I’ll see if I can just start teaching at work. I’d like to believe that there is a stable yoga studio. It’s possible nowadays, since more people are seeing its importance. I wish you well and more success on being a yoga instructor. Oh, I believe there are stable yoga studios that are outside the corporate model – there appear to be a few, in our market, even. To his credit, I don’t think Trevor is looking to create a stable studio or group of studios, however. He’s trying to get a lot more people practicing yoga, and quickly. He achieves that by removing some of the barriers that traditional studios inadvertently/intentionally make (i.e., inflexible schedules and cost structures), and by introducing some elements that are just little outside the yoga norm (retail, wellness education and philanthropic programs). For a lot of people (admittedly, most of them fit into a pretty narrow demographic), the compromise appears to be acceptable, for some or all of their yoga practice.